1. Liquid test systems, including testing of oem piston and parastaltic pumps. We can test fror FLOW, CURRENT CONSUMPTION, PRESSURE, and LEAK TESTING. Systems can be devloped that allow an operator to place the pump in a fixture, close a self-locking clamp, and press a single button that will cycle through multiple tests. We can output the test results to simple PASS/FAIL indicator lamps, or to software such as Labview for detailed recording and data analysis. 2. Leak test systems, including testing of pressure vessels, OEM products such as regulators, valves, household appliances, and many other types of OEM products. We can test for air and liquid leaks and product functionality. 3. Electrical test systems. We have experience in developing testing systems for UL listed appliances, performing the required "Hi-Pot" ground fault test, as well as test systems looking at current consumption, continuity, and many other electrical test functions for OEM applications. 4. Vibration testing, including monitoring of OEM motors for vibration analysis, RPM checking current consumption, and audible frequency analysis . 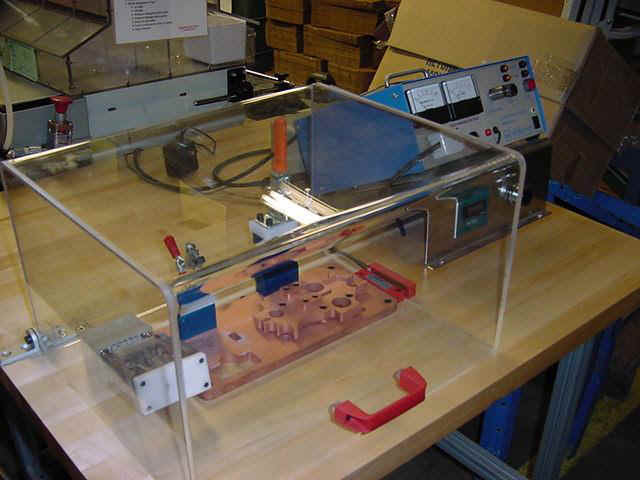 Altair Industries can offer a custom, cost effective test system for your precise requirements. We would appreciate an opportunity to hear about your project and see how we can provide you with the solution you need. Electrical Hi-Pot Tester for safety testing of in-home applicances. Custom fixturing for your assembly. Water pump tester with custom fixturing for small OEM parastaltic pump. Pass/Fail available for pressure, flow, and current/voltage draw. Programmable Valve Tester for multi mode OEM valve. Uses Smart Servomotor to cycle valve through all positions for leak testing of each part.